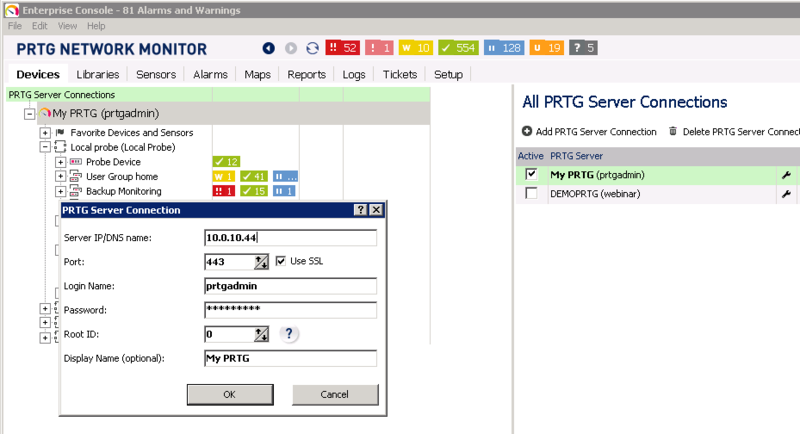 When I try to connect to PRTG via the Enterprise Console, the software displays a socket error number 10061 and I cannot connect. However, I can still log in to the PRTG web interface. What settings do I have to change to solve this? The Enterprise Console is a native Windows application and one of the interfaces that you can use to change settings and review monitoring data of your PRTG setup. In order to retrieve this data, the Enterprise Console must establish a connection to the PRTG Web Server. If you open the PRTG Enterprise Console and see a "socket error number 10061", this means that your Enterprise Console was not able to connect to the PRTG Web Server running on the PRTG Core Server. There can be several reasons for this. If you can still log in to the PRTG Web Interface but get this error message using the Enterprise Console, the most common matter is non-matching settings of Web Server and Enterprise Console. From the Windows Start Menu, open the PRTG Enterprise Console application. From the menu, select File | Manage PRTG Server Connections. The Devices overview appears. On the left side, click on PRTG Server Connections. On the right side, select a server entry and click on the edit Edit button (the wrench symbol). From the Windows Start Menu, open the PRTG Administration Tool on the machine that is running your PRTG Core Server. In the Web Server tab, you can view the section Select IP Address for PRTG's Web Server denoting the IPs that are allowed to establish a connection to the Web Server. The TCP Port for PRTG's Web Server is selected there, too. In the Administrator tab, you can set the login name and password that are used to log in to the interface. Please make sure that both the settings of Enterprise Console and Server Administrator match. Port "Web Server" tab, setting "TCP Port for PRTG's Web Server"
Login Name "Administrator" tab, setting "Login Name"
Password "Administrator" tab, setting "Password"
The values in the following screenshots are for illustration purposes only. Your own settings will vary. You can also use "localhost" instead of an IP address in both the Enterprise Console and Server Administrator (if Core Server and Enterprise Console are running on the same computer). 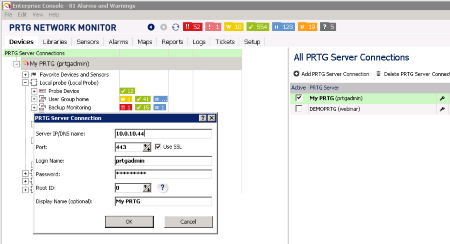 PRTG switches to port 8080 as a fallback after a restart when port 80 is already used, or to port 8443 if port 443 is not available (if this port is also not available, PRTG tries from port 32000 on until it finds an available port) and keeps the SSL connection. In this case, enter the currently used port (8080, 8443, or 32000+) manually in the Enterprise Console, because the EC cannot recognize this port automatically (as with port 443 and 80). You can check the currently used port in the PRTG web interface under Setup | System Administration | User Interface, section Web Server, table Currently Active IP Address/Port Combination(s). Change settings according to the table above. 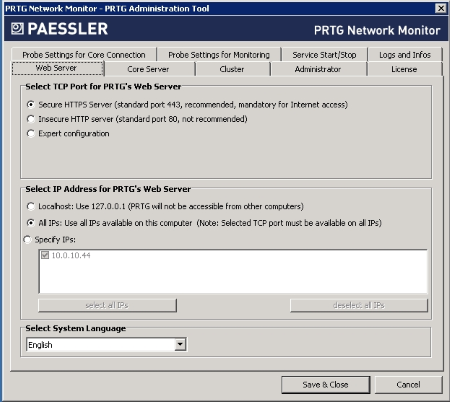 In both the PRTG Administration Tool and Enterprise Console, confirm the settings. When applying changes to the PRTG Administration Tool, PRTG Windows Services must be restarted so the changes take effect. You should now be able to connect with the Enterprise Console. Make sure a local software firewall does not block the connection. Make sure a local virus protection program does not block the connection. Make sure that the port is not already used by another application. Please see How can I list all open TCP ports and their associated applications? When you're connecting to the PRTG Core through a network (either LAN or WAN), make sure a (hardware) firewall does not block the connection.